I first saw the painting in James Wasserman's book on art and symbols of the occult. It's called "The Mother of the World." I was drawn to it immediately. About a third of the book is about a trip I took to Southern France to follow the Black Madonnas. There are 200 in France alone, 450 in the world. Although this painting is not a Black Madonna, she seemed numinous to me and the 'her" of the title, The Future That Brought Her Here, is the Divine Feminine principle which is returning to the world. This millennium is called The Millennium of Women, and I also think of St. John's reference to The Woman Clothed by the Sun in Revelation, who is in labor, giving birth, I believe to the the "New Earth" as predicted. The earth is feminine and the ancient goddesses are always related to the earth. She is also me, and my guides, as I was told the some of the spirits around me, whom I become aware of claire-sentiently in the book, are ME from the future. They are helping me with the ascension process, which is the process a lot of humanity is undergoing right now as the species hovers at the edge of evolutionary leap in consciousness. In the first chapter I tell about a spontaneous altered state experience I had and then wrote a poem about in 1984. 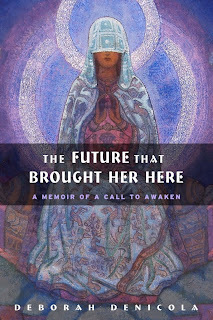 The poem is called "The Future That Brought Her Here" and relates to the experience I had. It was years later that several psychics told me the figures I saw around me through my third eyes were me from the future. I immediately remembered the poem. If you read the first chapter you'll understand the context. I liked that the memoir title also had several layers of meaning. The poem was published in 1994 by Alice James Books in my poetry collection Where Divinity Begins. FYI here is the poem. —the invisible pressure of some other time on time. "He created about 7,000 paintings (many of them are exhibited in well-known museums of the world) and about 30 literary works. Roerich is an author and initiator of an international pact for the protection of artistic and academic institutions and historical sites (Roerich’s Pact) and a founder of an international movement for the defence of culture. 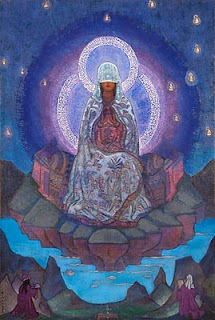 Roerich earned several nominations for the Nobel Prize." He was also a writer. Tremendously prolific. There is quite a lot of information on him and his other paintings are also marvelous. I chose the cover mostly for its symbolic significance. The World's Mother is holding her hands facing outward as if to extend healing energy. In the whole painting, which I've attached below, she is surrounded by lights that look like figures, whether angelic, or fairies, or little Buddhas, it's hard to tell. She sits on rock that is floating above sky, but the sky also looks like the ocean, so she is obviously associated with the landscape of the earth. Much of my book has to do with the earth and the power of the ley lines beneath it, what the aborigines call "songlines," which are the power centers that dowsers look for to find springs. Many of the ancient goddess figures were found buried at these "sacred" places over springs. I am happy with the cover, however, I wonder if it makes the book appear to be too religious. I don't want it to look "Christian," and I wonder if the cover has put off some people from buying it, or even looking at it because of that. It is a memoir, a modern story with research in it and perhaps it doesn't appear to be that at first sight. I guess the best part of it for me is the figure herself and the lovely colors. I do "dream image work" with individuals and groups, an intense process of re-entering the dream in a Theta brain state and reliving it. I guide people through their dreams with certain questions and eventually the meaning of the dream reveals itself through the emotional power of the images and associations. I also mentor writers, doing all stages of editing from development to copy.